The solution to find and start programs in Windows 8.1 and 8! 1.) Find and start programs in Windows 8! 2.) Find and open programs / APPs in Windows 8.1! 3.) More about open programs in Windows 8.1 and 8! See also: ►► Disable file explorer auto expand in windows 8.1 / 10, how to? If you want to search for files, press the keyboard shortcut [Windows+F]! But if you're search after settings (System Settings), use the keyboard shortcut [Windows+W]! In Windows 8 / 8.1 you can use the Start Search field comfortably after searching program! (Image-1) Find and start programs in Windows 8! If you want to see all the programs and APP's in Windows 8.1, press the Windows key, then press the TAB key and ENTER again! 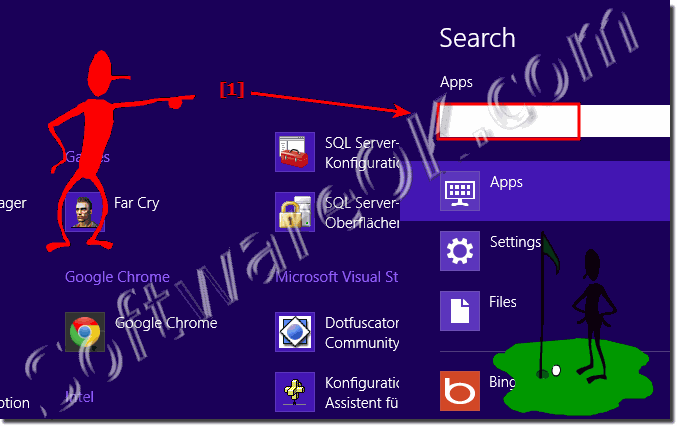 (Image-2) Find and start (run) programs in Windows 8.1! ... uninstall Programs in Windows 8 / 8.1 ! ... Program Files (x86) Windows 8, what a folder (directory) is this! ... Help in the Windows 8 files will open with the wrong program! ... The fastest way to find and open the Programs / Applications folder in Windows 8 and 8.1! ... run / start on Windows 8 / 8.1 programs in compatibility mode! Windows-8 - FAQ-135: Find and start programs in Windows 8.1 and 8! How to get to programs in windows 8, How to find open programs in windows 8.1? How to execute a program from the desktop in windows 8.1? Where to find all programs on windows 8 start? Launch programs on windows 8.1? See programs on windows 8.1? Find all programs windows 8.1? Where to find my origanal programs on windows 8.1? Where to find programs in windows 8.1? How to get to programs in windows 8.1? How to find run program in windows 8.1? How to locate programs in windows 8.1? Finding all programs in windows 8.1? How to search for programs in windows 8.1? Where are programs windows 8.1? Open a program inwindows 8.1? Find programs in windows 8.1? How to find programs on windows 8.1? 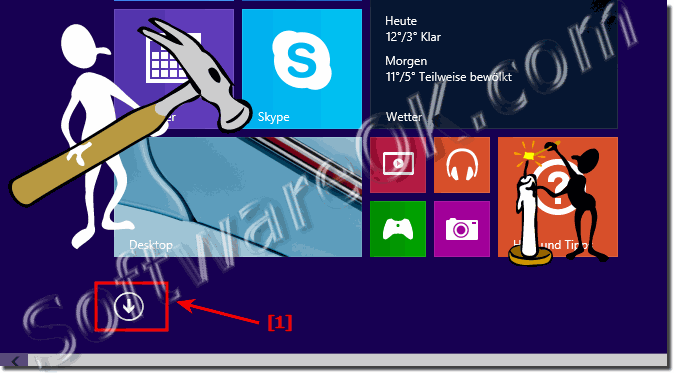 How to open start all proagrammes in windows 8.1? How can I to Find program on Windows 8.1? How to find programs in 8.1? Where is all programs in windows 8.1? How do i find accessory programs in 8.1 site? Findings programs to open in windows 8.1? Where is all programs in win 8.1? Where is 'start all programs' in windows 8.1? Installed programs in windows 8.1? How to Start programs in windows 8.1? Open program on windows 8.1? START AND ALL PROGRAMMES IN WINDOWS 8.1? How can i find programs or apps in windows 8.1? Start program files windows 8.1? How do i get a program to launch on startup with 8.1? How to find all programs on windows 8.1? Where are the programs in windows 8.1? How to run find and run programs in windows 8.1? Open Programs in Windows 8.1? Missing programs in programs and features in windows 8? Finding programs in windows 8.1? How to find your programs in windows 8.1? Windows 8.1 can't find microsoft programs? How to find start applications in windows 8.1? Where are the programs inwindows 8.1? Can not Find programs windows 8.1? How to Find programs in windows 8.1? How to find programs and settings on windows 8.1? Find start-up programs in Windows 8.1? How to find programs in window 8.1? Windows 8.1 start all programs? Where are programs in windows 8.1? Finding programes in windows 8.1? FINDING APPLICATION START WINDOWS 8.1? How to view open open programs in windows 8.1? Where are programs in 8.1? Unable to find a program in program and features? Start a program in windows 8.1? How to launch programs in windows 8.1? Find a program in windows 8.1? Windows 8.1 where are programs? Where is start programs in windows 8.1? Windws 8.1 where to find programs? Windows 8.1 find a program to run? How to Finding programs in windows 8.1? Using windows 8.1, finding programs? Where is programs in windows 8.1? See open programs windows 8.1? How to find 'all programmes' on windows 8? Locating programs in windows 8.1? Hoe to get to all programs in windows 8.1? How to install programs on windows 8.1? How find a program launch list in windows 8.1? See all the programs in program and features? Finding programs in win 8.1? Finding programs on windows 8? Open a program in windows 8.1? Where is start up pregram in 8.1? Here are all programs in w8.1? Run installed programs win 8.1? How to get start and programs in windows 8? Windows 8 where to find programs? Where can i see the installed programs in windows 8.1? Locate programs on windows 8? In windows 8.1 where do i find all programs accessory run? How-to download programs on windows 8.1? Where we find the program on win 8? How to run programs on windows 8.1? How do i start a program in windows 8.1? How can I find what programson windows 8.1? How to check all programs windows 8.1? Can't find All Programmes on Start? How do I run a program on windows 8.1? Howto find prgrams n windows .1?